“Imagine what would happen if one of your physical organs stopped working. The consequences could be life-threatening. If one of our spiritual “organs” is impaired, however, it often goes unnoticed, even though the loss in functioning is just as serious.” (Pemell, p25) Because the soul’s organs are not visible,they may even remain as a mystery as to how they work or how they impact our lives. Most of us, today, have some loss of spiritual function or other and may not even know it. If one understands the Self, the “spiritual anatomy” of the soul and how it functions, then “spiritual fitness and power” can become a focus or aim in life. The spiritual anatomy through which the souls functions consists of: (1) mind, intellect/conscience, and (3) the impressions that the soul has experienced time and time again on its journey which become a collection of “sanskaras”, ie habits, characteristics and personality traits. The soul uses these faculties to think, feel, experience, realize, discern, remember, express, comprehend, learn, change, and act. How do you know when you are functioning fully as a soul? What does it feel like on a practical level? As a fully functioning soul aware of itself, you’ll feel full, content, emotionally and mentally balanced, free from obsessive thoughts and addictions, and in general~happy, loving, and detached, not some of the time, but constantly! You may be thinking this doesn’t sound possible in a 3-D world of continual change and you are partially correct. For as your consciousness deepens, you will find that spiritually you become aware of more than this 3-D dimension. As you become connected to another dimension, by practicsing meditation, you can enter a purely spiritual dimension of light, and recharge and absorb spiriutal sustenance that fills you with happiness and peace, even when it is not present in the world outside. What is required to live from this soul awareness is the development and exercise of your spiritual muscles or if you will the development of “ruling power” over your kingdom. Since your kingdom/queendom is made up of your mind, intellect, and ‘sanskars’, the extent to which your ‘advisors’ of mind, intellect, and sanskars are cooperating with you is the extent to which you will feel that your kingdom is running optimally. 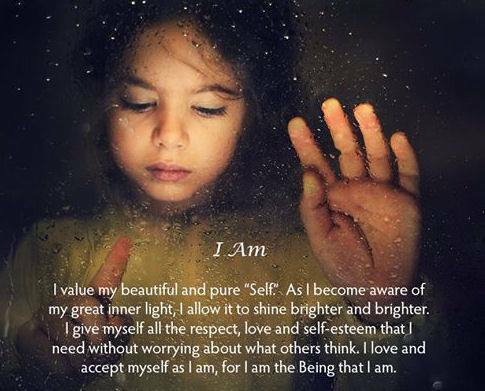 Let’s take a look at what this involves and how we can develop and strengthen our ability to be ‘self-sovereign’ and fully functioning as a soul-conscious being. Have you realized that you, the soul, are the one who makes your body function? Yes, you are the master almighty authority, the one in control. However it is only when you remain aware that you are the master that the advisors will follow your direction and guidance. If you, the soul have gone on automatic pilot, your advisors have to work overtime and without your authority. What does this feel like? Lets start with your first power which is the thinking of the mind. If your first power is not working hand in hand with you the soul, than your other powers will also be off. This could result in the mind becoming undisciplined, disorganized, and unable to focus. If you have ever experienced a chaotic, mind firing off thoughts left and right, you know how this can be your worst enemy, whereas a steady, deeply focused mind, is your best friend. The task of the mind is purely to facilitate and create thought, but it does not have the function or ability to exercise control over the quantity or quality of those thoughts. It creates thoughts as seeds for actions. You, the soul, require a powerful intellect to understand, discern, and decide which thoughts to take action upon. “The most elevated desire of the mind is to be peaceful…”(Panjabi, p19) Thoughts that create a sense of inner calm and coolness are thoughts which are focused on only what you intend to do. These are considered powerful thoughts. Powerful thoughts are benevolent and will enable you to accumulate spiritual muscle. “When your thoughts are pure and powerful, you are able to transform negativity into positivity at the level of thinking.” (Panjabi, p20) An important key to creating powerful thoughts is the following rule of thumb: “have positive thoughts for the self and others. Having positive thoughts for the self is very deeply connected with having positive thoughts for others…If you don’t have positive thoughts for others, it indicates that you don’t have positive thoughts for your self.” (Panjabi, p20) By understanding your true nature, you can develop a great deal of self-respect and appreciate who you are as an eternal, unlimited soul. This is such a good place to start your meditations or contemplations of “who am I”? Starting your day with the powerful thought that: “I am an eternal being of light”, or” I am a bodiless soul,” or “I am a point of unlimited light sitting in the driver’s seat of this vehicle” will remind you of your true nature and how what you are thinking about determines your state of being and the quality of your day. Presently, many world issues, as well as many people, are in such a state, that you cannot deal with them through words, so it becomes essential to use positive thoughts and vibrations to make a difference. Experimenting with this will give you a real experience, after all, “the proof of how great the cook is, is in the pudding”. Start with something “manageable”, such as a disgruntled colleague or co-worker, friend or relative. As an unlimited soul, send out your light and love to them, cover them with a protective shield of love and light. Wish them peace and serenity. Do this many times during the day, over an extended period of time and note how your relationship with them improves. As you many successes sending out powerful thoughts to others, expand your capacity for goodness, apply it internally to a health issue and watch your health improve. Keep a record of your “soul experiements”. Eventually expand your prowess to an area of the world that is out of balance and needs peace. Trust that you are having an impact. As your awareness of your own self respect grows, so will your humbleness. You may even begin to recognize that you are not alone in your positive efforts, but that you are part of an awakening humanity who have unconditionally aligned themselves with the Source of Goodness and it is from this Source of Goodness that you can continually draw strength and spiritual power. As you come to know and accept that you are undeniably supported by the Benevolent Source, you will become aware of being an extension of the Source, a conduit for the Source, a helper in this One’s elevated task of restoring goodness, kindness, peace, and love to uplift and create a new world. This piece is meant to be helpful to all in using your soul power in concrete ways to create more peace, love, kindness, and respect in our world.